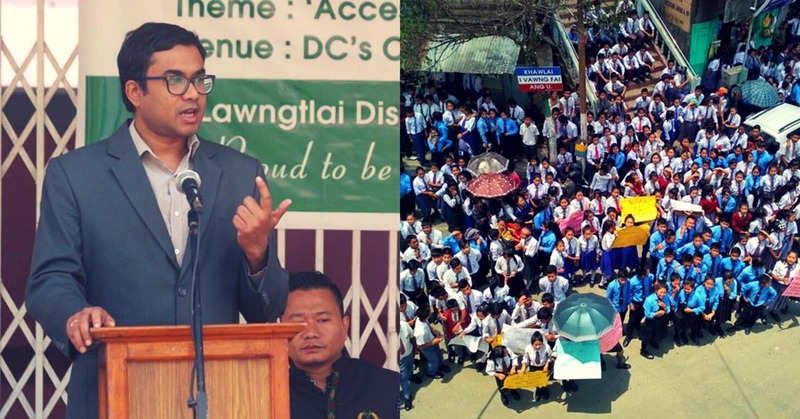 Dr Arun T, an IAS officer of the 2013 batch of the AGMU cadre, first posted in Mizoram in December 2015, now is known as ‘People’s officer of Mizoram’. Dr Arun T, who hails from a small town of Arsikere of Hassan district of Karnataka, completed his MBBS and specialised in dermatology, but decided to take a leap of faith and attempt the Union Public Service Commission (UPSC) examination. After clearing the UPSC examination, he joined Mizoram and with his pro-people works wherever he is posted, Dr Arun is now loved and respected as the People’s District Collector (DC) in the state. This doctor-turned-IAS officer’s transfer also sparked a public protest against his transfer, reports The Better India. From pioneering telemedicine in the remote districts, he was posted to bringing back teachers, who refused to work in rural schools, the short span of his service in the northeastern state of Mozoram has been marked with applaudable achievements. IAS officer Dr Arun T rose to the limelight a few months ago, after an unexpected transfer order came from the Mizoram Chief Minister. As per a report by TNT, the surrounding controversy was that the Mizoram CM allegedly cited, the people of Mizoram preferred a Mizo DC which had sparked a social media debate where agitated people came to the support of the DC. Dr Arun T shared withThe Better Indiahow his work majorly focused in two districts – one being Kolasib, the first district he was posted as the Sub-Divisional Officer (Civil) and Lawngtlai district from where he was transferred recently. Lawngtlai is a small and one of the most remote and backward districts of Mizoram. The district shares borders with two different countries, i.e. Myanmar and Bangladesh. Being a doctor, the pro-people IAS officer first wanted to work for affordable and accessible healthcare for the people of the district. It was Dr Arun T who pioneered the first telemedicine facility at Lawngtlai. A collaboration between Puducherry’s Jawaharlal Institute of Postgraduate Medical Education and Research (JIPMER) and Lawngtlai’s district hospital, this telemedicine facility aims to provide investigation and speciality consultations online, says the report. Thus Dr Arun made affordable healthcare in the district where infrastructure have been a distant dream. The next target area of the IAS officer was the education as the literacy rate (66 per cent) in Lawngtlai was the lowest in Mizoram. During his posting in the district, he also took charge as the caretaker of Chakma Autonomous District Council (CADC) and noticed several discrepancies. The teachers who were posted to the remote villages reportedly refused to work there and silently began to work in administrative and clerical positions at the council headquarters for which the children in rural areas were suffering for no fault of theirs. DC Arun immediately ordered a probe and asked 32 teachers, who were employed after 2005, to be back to their schools and the village children got their teachers. Dr Arun shared that out of 189 villages in the district, 30 are inaccessible. They either have to walk for long distances or take boats to reach them. The teachers, who are posted in such schools, are sometimes completely cut off from the rest of the world. In order to solve this issue and keep the teachers posted in remote areas motivated, Dr Arun came up with a rotational transfer policy. As per the policy, in every three years, the teachers working in all three locations would be transferred from rural-urban and vice versa. The IAS officer also started a public grievance redressal initiative called ‘Mipui Aw’ during his posting in Kolasib district. This initiative translates to Voice of the People in Mizo and became popular as the day all department heads (e.g. electricity, water supply etc.) in the district would address public grievances. On the first Tuesday of every month from 10 am onwards, the heads would interact with the general public through one-on-one meetings, letters, etc. and brainstorm solutions for the same. Dr Arun, who was in Lawngtlai for just six months, was transferred to Kolasib again.